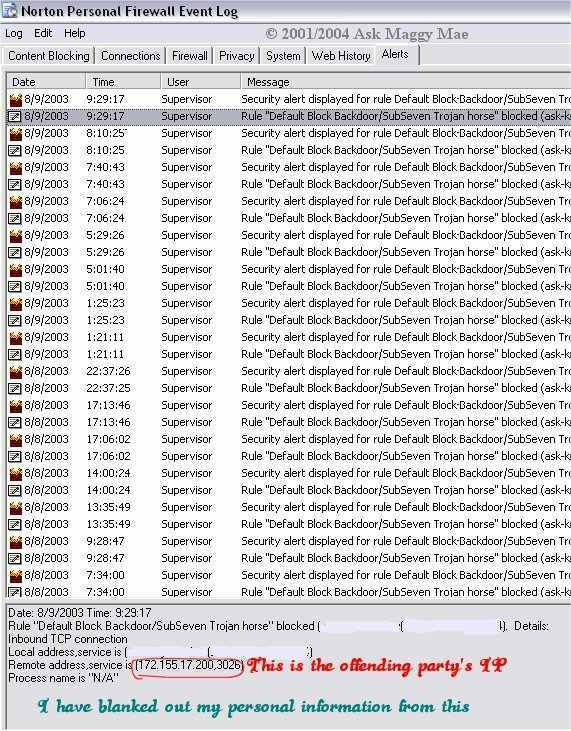 In the log for each event you will see two lines (if you created a rule) The first line reports the security alert but the info in the lower frame is not the complete info needed to report the issue. What you really want is the Rule, this give you the evidence you need to report the attack. Once you have highlighted the rule in the top frame, look in the bottom frame. Look for "Remote address, service is (IP Address)". You will want to copy the first 4 sets of numbers to paste them into the search. If you look at the graphic above you will see a ,3026, this part of the IP address you do not want to include in your search.. You want ***.***.***. *** and these can each be 1-3 digits. Go to either DSL Reports or Arin and enter your copied IP Address into the appropriate place and hit enter. Once you have their email address go to your email program (or a contact form) and write your complaint. Copy your event log for that ISP (The grayed area in the graphic above) and paste it into the email or contact form. Send your email or contact form. Be prepared if you are doing a large list of complaints that each and every ISP will send you a confirmation email. At least you know they received yours!